Seasoned with Creole seasoning, these black bean cakes will have you coming back for more! Delish! 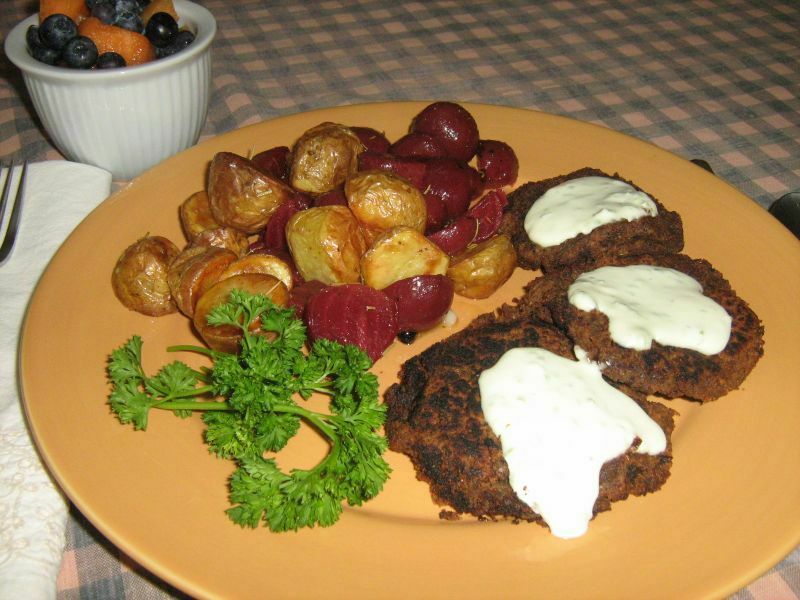 These black bean cakes with lime peppered mayo also appear in the recipe for roasted beets and gold potatoes, which we used as a side. Click the link for that recipe too! But, these black bean cakes are delicious! When combined with all of the seasonings that go into this dish they are phenomenal! Very spicy and peppery - the Creole seasoning brings out the full flavor of the dish and is complemented so well by the lime-peppered Mayo! Both dishes, the black bean cakes and the roasted beets and gold potatoes make for a very tasty and satisfying experience. Give them both a try. You'll make them again! Place the beans on paper towels to soak up the excess moisture. Bake the beans on a cookie sheet for 20 minutes. Let cool. In a food processor, combine the beans, bread crumbs, vegan butter, cilantro, shallots, garlic, Creole seasoning, salt and pepper. Refrigerate for 1 to 2 hours. Mix the vegan mayonnaise, the lime juice and the jalapeño in a bowl. Season with salt and pepper and refrigerate until ready to serve. Serve with the black-bean cakes. Roasted Beets and Gold Potatoes. Source: The Quantum Wellness Cleanse by Kathy Freston. Used by permission.